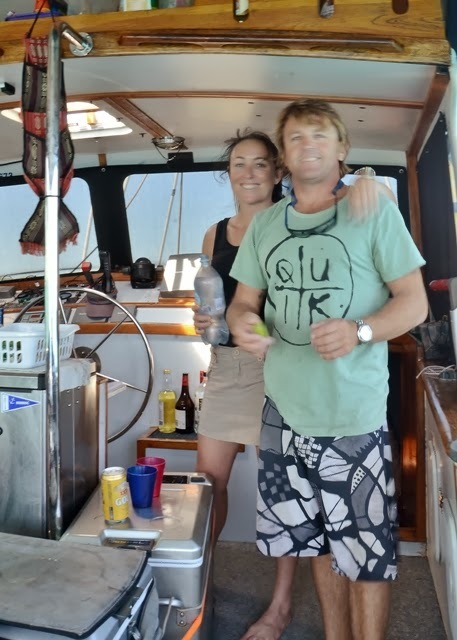 ALANA ROSE spent twelve night moored off the Gantheaume Point Beach out from the town of Broome. Towards the northern part of this very long sandy beach is known as Cable Beach where a lot of the big resorts are situated. 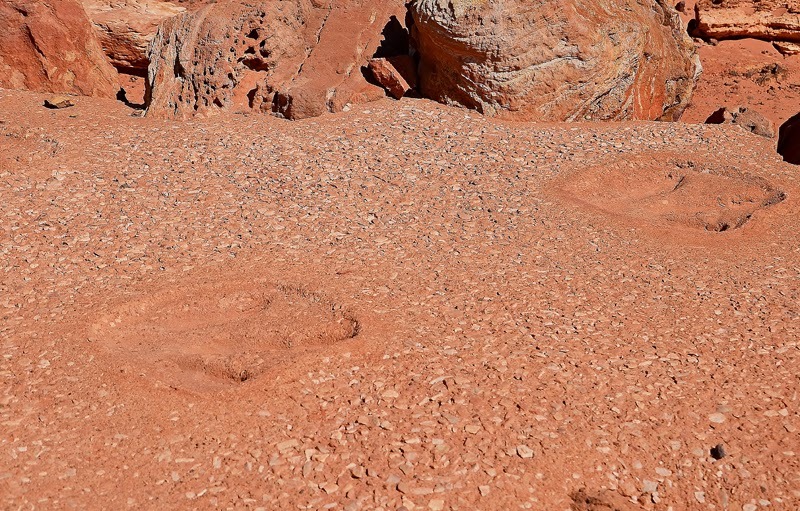 Gantheaume Point is located approximately 6 km from town features some amazing rock formations; this is a scenic area with red cliffs and turquoise water. In the sandstone at the water's edge petrified dinosaur footprints over 130 million years old can be seen at a very low tide but for the benefit of visitors a plaster cast of the tracks has been embedded at the top of the cliff. 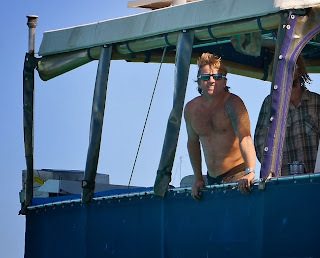 Throughout our stay we were to experience mainly SE - E - NE winds which came off the land. We were lucky to be tucked in behind Gantheaume Point with a coral reef that extends out to seaward but there was a constant running swell from out to sea which produced some surf wave action on the shore, this surf action made for an interesting time getting ashore or launching your dinghy to get off the beach. 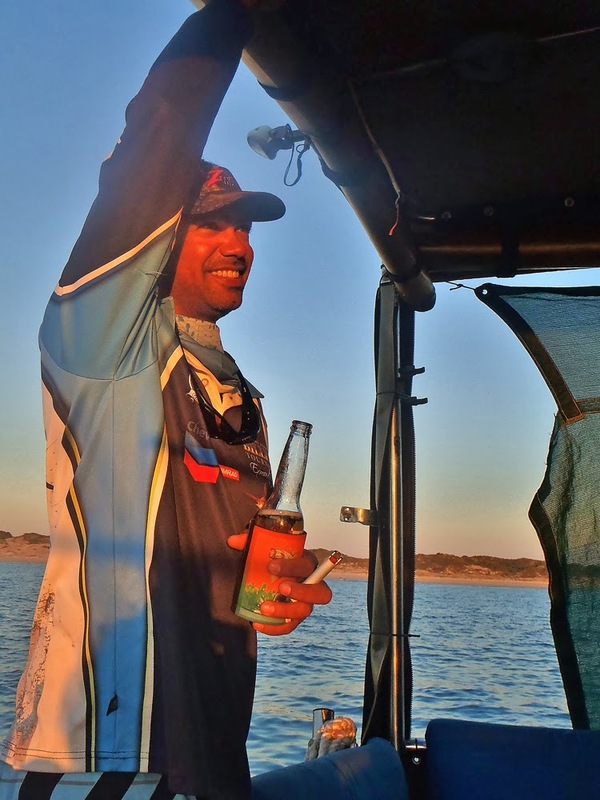 I don't think I would like to have been in the anchorage in anything from the NW - W - SW and I do believe that most of the boats would disappear around the corner into the Roebuck Bay under those conditions. 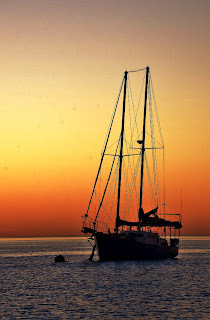 There were many boat mostly moored; we had been fortunate enough to get a free mooring from a fella (Stephen Nasso) that we had met at Prudhoe Island in the Kimberley. 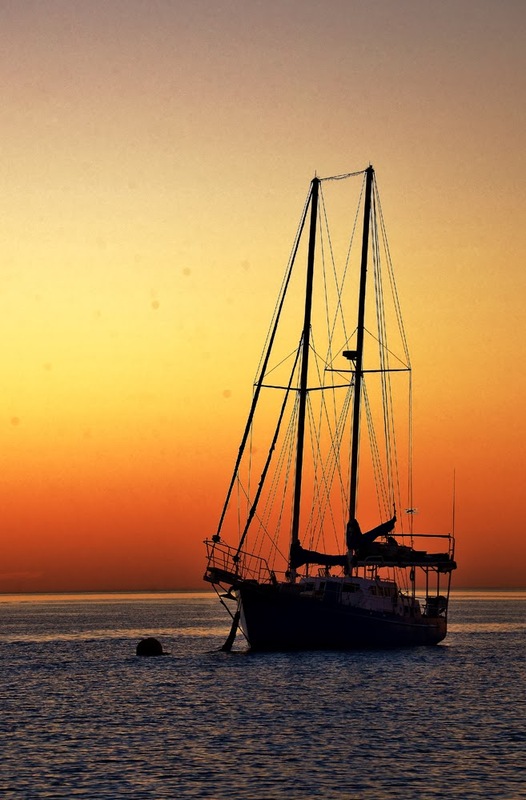 Some transient boats had chosen to anchor and seemed to have had a good hold. 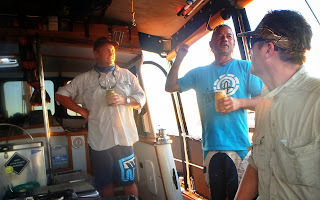 Some of these boat we knew already and many other we were to meet over our time in this anchorage. On a sunny day, especially on weekends, the Gantheaume Point end of the beach is where it all happens. 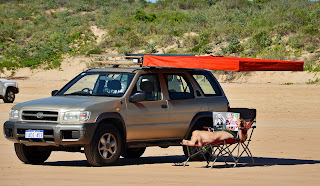 Not really, but I did see that a great number of people with their cars (regular and 4X4's) and umbrellas descended onto the long shoaling beach. The only exception was when there was a big moon high tide and then there was practically no beach at all. The tidal range was big, it was over 9mts at the full moon tide on the 24th & 25th July 2013, making the beach shoal out for what seemed like mile when having to drag a dinghy up or down. Our dinghy does have big wheels but it was still a hell of a long way for poor old MrJ, the workhorse of this duo. 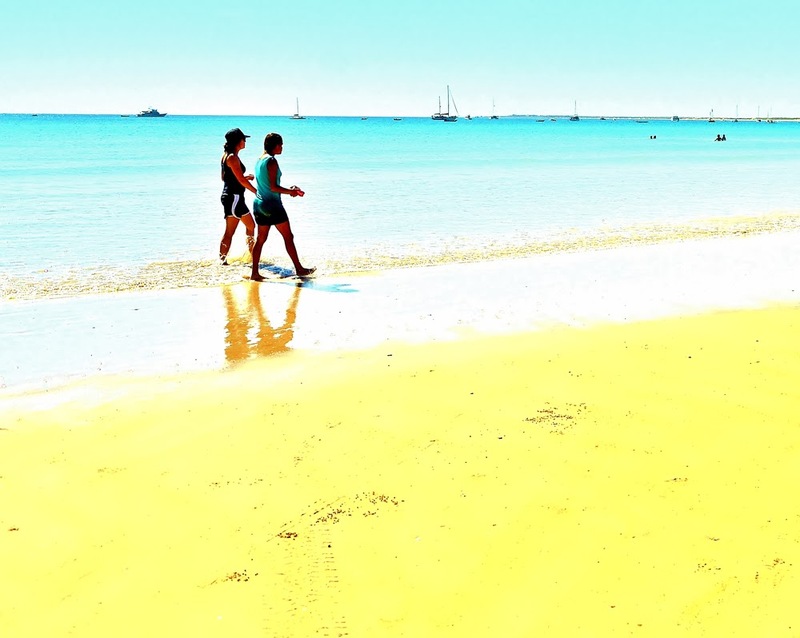 Tourists embark from this beach to do the sunset cruises. Up the other end at Cable Beach all the tourists flock to enjoy a dip in the sea or lazy about in the sun on the sand. A popular tourist attraction on Cable Beach is taking a sunset camel ride. 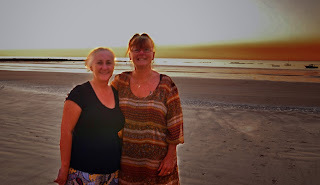 The beach was a good meeting place for everyone and a great location to watch the beautiful sunsets. 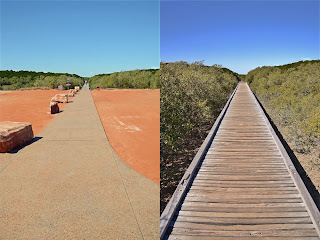 Broome is now a modern town, a popular holiday destination that has an interesting history. Broome was once a town in which lanes lined with noodle stalls and opium dens, and the slum dwellings of hawkers and prostitutes were more reminiscent of Asia than Australia; and where pearl shell mattered more than human life. Chinatown was once the bustling hub of pearl sheds, bawdy saloons, billiard rooms and Chinese eateries. You can now find pearl showrooms, a variety of retail outlets and sidewalk cafes adding a 20th Century touch to the town. Cultured Pearling Monument: Mr. Tokuichi Kuribayashi, originally from Nippon Pearl Company, Tokyo, Mr. Hiroshi Iwaki and Keith Francis Dureau from Pearl Prop. 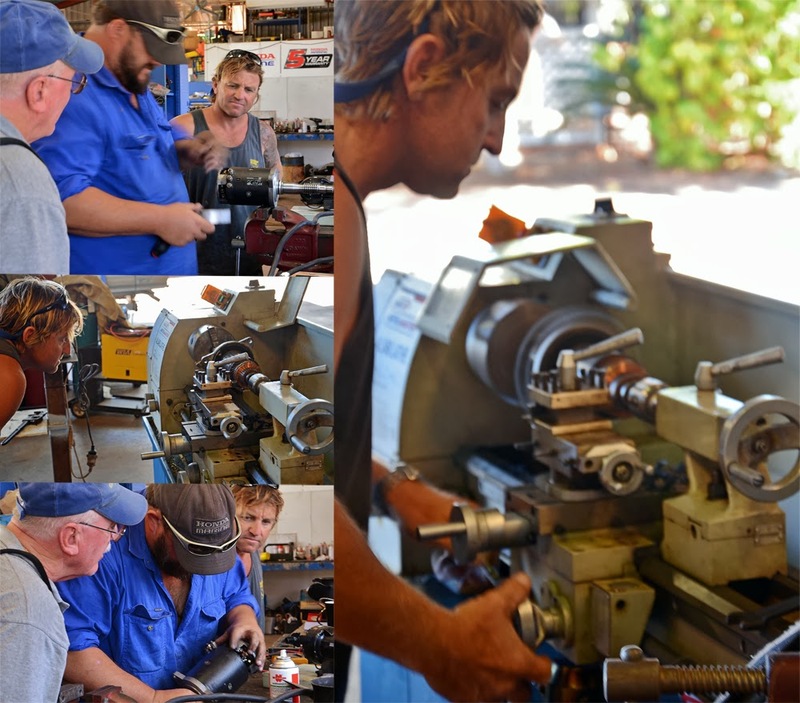 Ltd. were pioneers in the cultured pearl industry in Broome. The three life-size statues are now on display on the grassed area of Carnarvon Street in Chinatown. 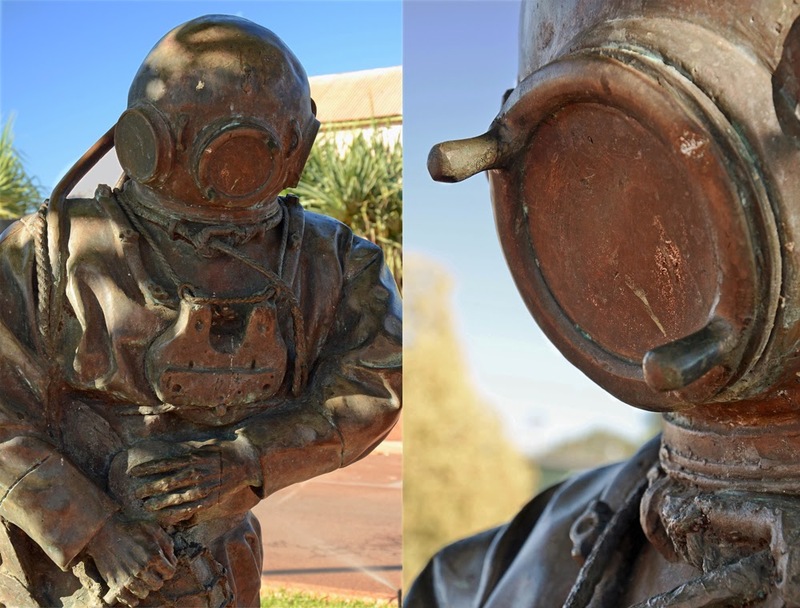 Hard Hat Diver: This life size statue of the Hard Hat Pearl Diver adjacent to the Cultured Pearling Monument in Chinatown was erected in 1999 to pay tribute to the role that the Hard Hat Diver played in establishing Broome as the centre of the world's pearling industry in the early 1900's. These early Pearl Divers came from diverse cultural backgrounds, and this resulted in Broome being exempted from the White Australia Policy, making the town a pioneer of multiculturalism in Australia. Around 50 of these divers along with many of their ancestors still reside in Broome today. Sun Pictures: Officially opened in 1916; it is believed to be the oldest operating open-air picture garden in the world and is open for the public to view its history. This unique indoor/outdoor theatre has withstood the ravages of war, cyclones and king tides. Housed in the foyer is an excellent display of movie memorabilia. Located in Chinatown the theatre is operating and current movies are shown every night. 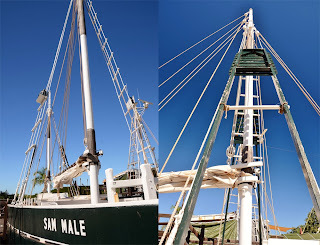 Pearl Luggers : On Dampier Terrace we admired two of the last surviving perfectly restored Pearl Luggers, the Sam Male and the DMcD, and a heritage listed Old Pearler’s Quarters in which we saw more than 140 years of Broome's unique maritime heritage taking an historical journey through the life and times of the pearl divers. 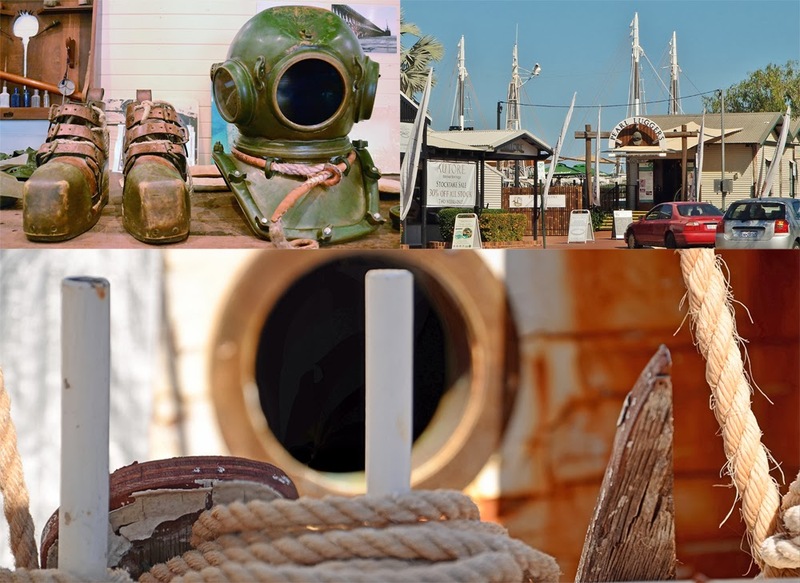 Streeter’s Jetty was the original jetty for the pearling luggers based in Broome. The jetty is still used to support vessels for modern day pearling and the occasional lugger. It is located on Dampier Terrace, at the end of Short Street. 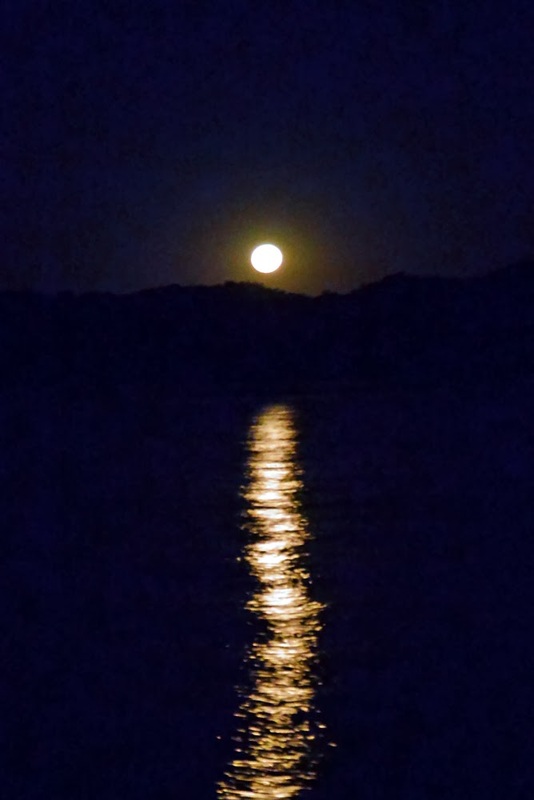 Staircase to the Moon: This natural phenomenon is caused by a full moon rising over the exposed mudflats of Roebuck Bay at extremely low tides, creating a beautiful optical illusion of a staircase reaching to the moon. Occurs March to October for 3 nights every month. We did not get to experience this phenomenon being 6ks away anchored off Gantheaume Point Beach, but I did get a lot of sunset shots. Courthouse and Courthouse Markets are located on the corner of Frederick and Hamersley streets. 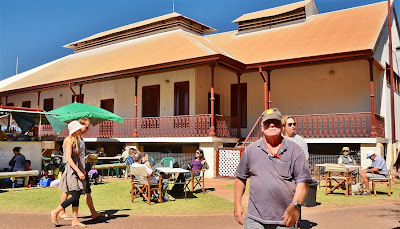 Built in distinctive "Broomestyle" architecture, the courthouse was the original Cable House, where the Broome end of the oceanic telegraph cable terminated. This is where the popular Courthouse Markets are held on Saturday mornings from 8am - 1pm all year. The relaxed atmosphere, shady trees and lawn areas make the Courthouse Markets the ideal place for visitors and locals to mix and sample the quality and range of products available from the local area. Products include fresh produce, photography, honey, preserves, indigenous and contemporary art, many hand-crafts, clothing, jewellery and a diverse range of freshly cooked food. Buskers entertain the crowds with music and performance. Deep Water Port located at the end of Port Drive is Broome's water link to the world. Built to replace the old jetty near Town Beach, this massive structure can accommodate large cargo and cruise ships at any tide (which can run 10 metres!) The wharf is a popular fishing spot and is open to the public except during cargo operations. Roebuck Hotel or as the locals call it, the Roey, was originally built by E.W. Streeter in 1880 to provide incentive for the pearling fleet to stay in Broome. It has always been a focal point of social gathering. In 1904 the hotel was destroyed by fire and rebuilt. Mrs Nightingall purchased the hotel in 1955 and made extensive renovations, including the addition of pre-made bedrooms transported by semi-trailer from Perth. In 1973 the hotel changes hands again, purchased by the Swan Brewery and continued to be popular amongst young people. The modern day hookah divers along with the burgeoning oil and gas riggers provided many hearty evenings in the shell grit beer garden. A notable Broome identity purchased the hotel in the late 80’s and made a number of extensions and renovations and in the early 2000’s purchase of the local nightclub at the end of Dampier Terrace. Broome Staircase Designs has been operating in Broome for twelve year. The artist and designer of all the beautiful peal jewellery is Julia Prynne, her inspiration being the Staircase to the Moon. This amazing even takes place at the foreshores of Broome at only a couple of times a year. Each piece of their Staircase Collection is designed and made exclusively by Broome Staircase Designs for their showroom in Brome and will not be found anywhere else in the world. The shop is situated in the Information Centre building. MrJ and I went along to one of their very informative Pearl Information Talks. The pearling industry is talked about, the pearl culture and life is discuss and was shown to us through active displays. 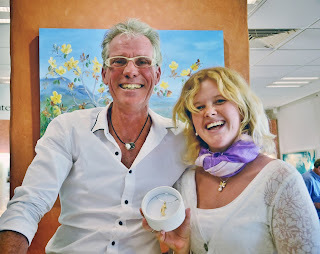 All customers’ names were put in a container and one name was drawn out at the end of the talk/display enabling this person to win the actual pearl that had been prised form a fresh shell. I didn’t win but MrJ did buy me an early birthday present. Did you know that there are several ways to grade a pearl? The Lustre of a pearl is perhaps the most important feature of all. This is the outside orient of the pearl or the thickness that you can see. The lustre of a pearl will sometimes show an amazing reflection within the pearl layer itself. Sometimes these lustres appear to have a pinkie hue about them. The lustre of a pearl can also pick up colours of an item that you are wearing or standing near, thus characterising itself to its owner. The Freshwater Pearls were not from Broome, they are imported from other countries. They are cultured in a similar process to the South Sea Pearls only in mussel shells not oysters. South Sea Pearls are the most sort after pearls in the world, especially the South Sea Pearls that are from Australia. These pearls are cultured from a process of nucleating the pearl oyster shell with a bead made from shell. 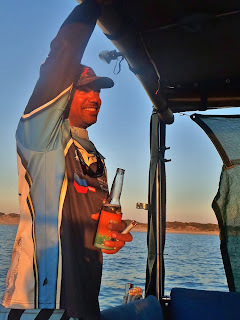 Still, the Dampier Archipelago, Dampier Peninsula, Roebuck Bay and of course the famous Roebuck Hotel on Dampier Terrace are all named after this first visit. An unsuccessful attempt to develop the area to graze sheep started in the 1860s and was soon abandoned. Cattle arrived around 1885, when the McDonalds and the Duracks established the first cattle stations across the Kimberley. 1861 was the defining year in Broome's history. A new species, the pearl oyster Pinctada maxima was discovered in Roebuck Bay and turned out to be the largest pearl shell in the world. The pearling industry was a major economic force for over one hundred years in northern Australia and for business interests in the southern capitals from the 1850s onwards. However, alongside the development of the industry were stories of forced and indentured labour, danger and death. 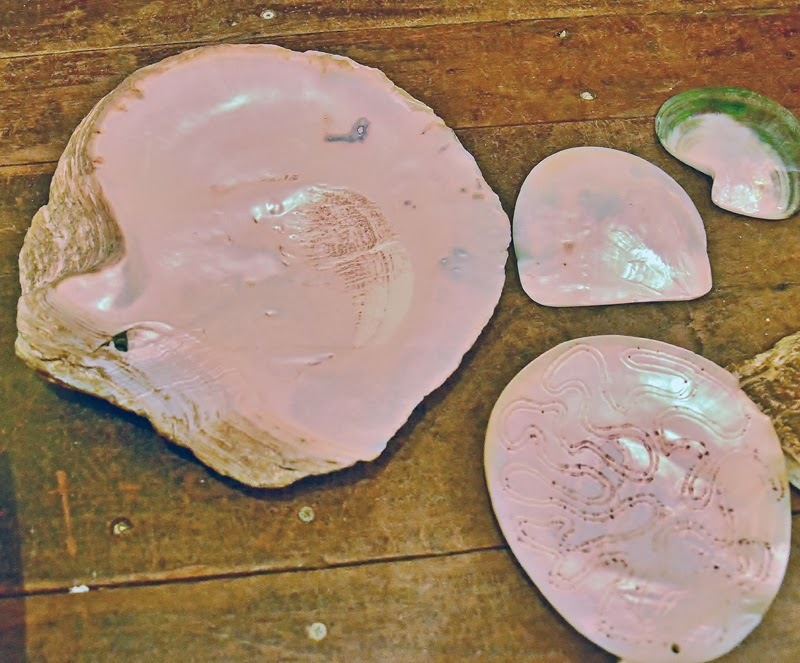 Pearl shell and Mother of Pearl were the main focus of the industry as the shell was used to make buttons, cutlery, hair combs, jewellery items as well as art objects and inlay for furniture. The cultured pearling industry came to fruition much later. 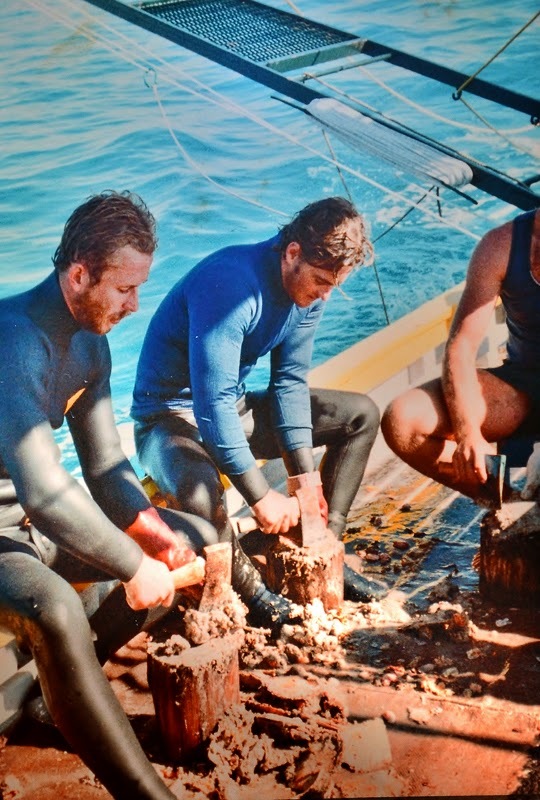 Australia's pearling industry began long before European settlement. 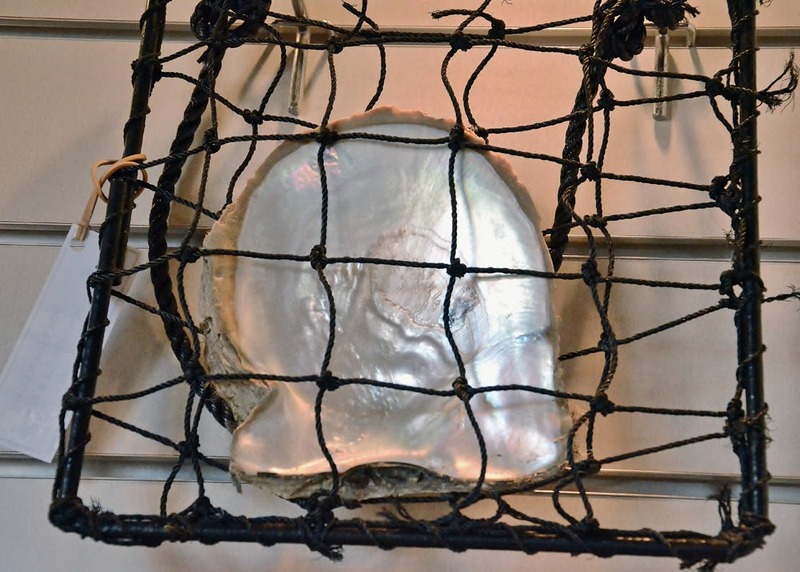 Northern Australian coastal dwelling Aborigines harvested the abundant pearl shell from the shallow waters and had a well established trading network for pearl shell. 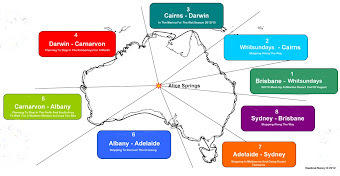 Within Australia, pearl shells travelled further perhaps than any other item. In Western Australia an explorer saw an aboriginal wearing a pearly oyster-shell which had travelled at least 500 miles from its point of origin. Aborigines also traded with the Macassan fishermen from the Indonesia island of Sulawesi3 who harvested beche-de-mer, trepang (sea-slugs), tortoise and pearl shell. 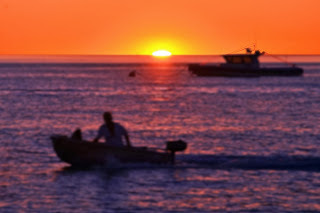 Folklore, songs, cave paintings and the diaries of Matthew Flinders tell us of links between Australia and Indonesia dating back 500 years with traditional visits from Indonesian fishermen4 continuing until the 1970s. 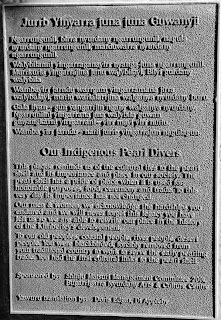 A dark history of pearl diving - From 1862-68, local Aborigines worked dry shelling 1without wages, collecting oysters in the shallow waters of Shark Bay. Within three years, the supply was so low that larger boats were sent out two kilometres off shore to collect oysters in deep water. Six to eight Aboriginal men and women in a boat would naked dive for shell. This meant they had to dive down deep with no oxygen, no snorkel and no mask. 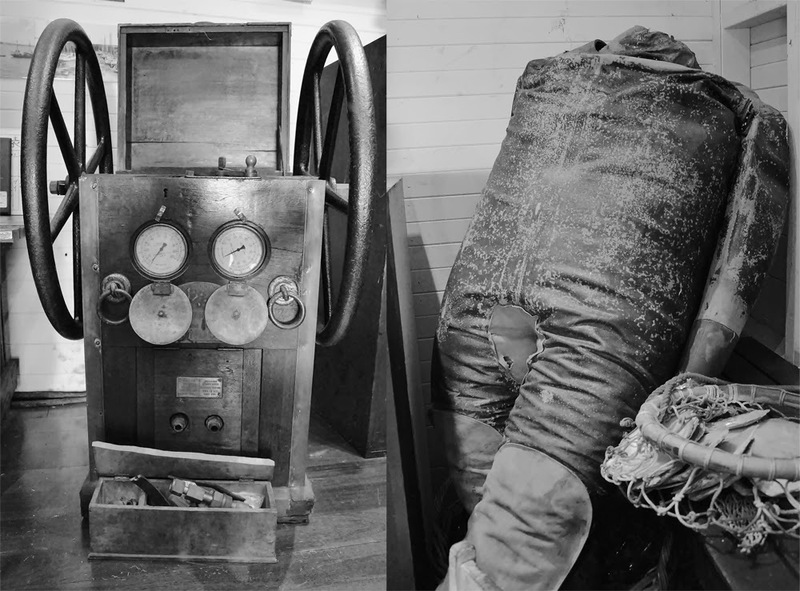 Employment conditions were regarded as dangerous as well as unspeakably squalid and dirty which contributed to a high degree of accident and death. The invention of diving suits revolutionised the pearling industry in Australia. Not only could divers go deeper than ever before, they could also stay underwater longer and collect more shell and pearls. 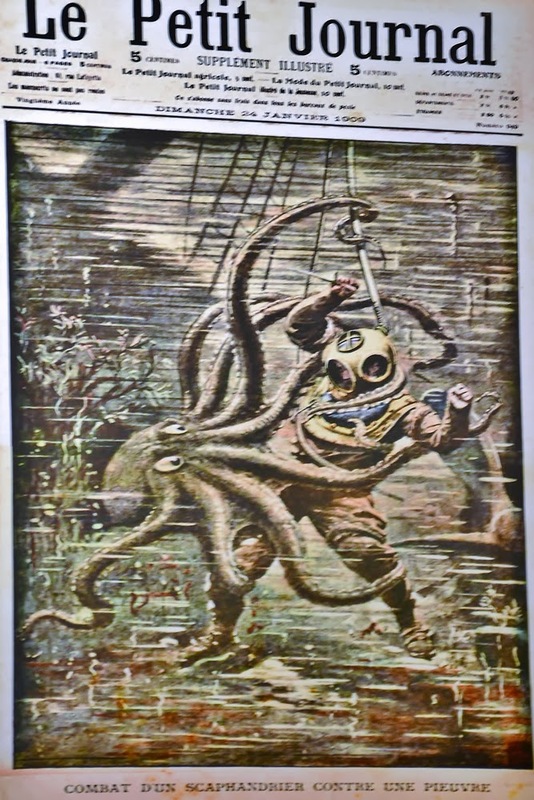 These divers wore vulcanised canvas suits and massive bronze helmets and were lowered over the boat's side to spend hours underwater. 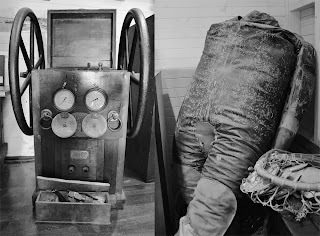 On the bottom they struggled about in lead-weighted boots, often almost horizontal as they peered through inch-thick faceplates into murky waters, frantically scooping oysters into bags because divers were paid by the amount of shell they collected. As time went by many different races became involved with the pearling industry. 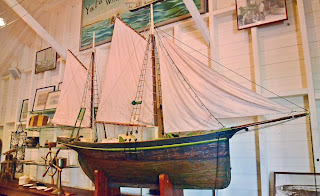 The races included Chinese, Japanese, Sri Lankans, West Australians (mainly Aborigines), Torres Strait Islanders, Manilamen and Filipinos from the Philippines, Malays from Malaysia, Rotumah men from Roti, Koepangers from Timor, and Amboinese from the Moluccas. During the olden days of pearling, the various races were grouped into their own social classes each with varying importance. The highest and most respected class were the white pearling masters who built and pioneered the industry, because they had the money. The pearling masters rarely mixed with the other coloured races and held themselves apart. 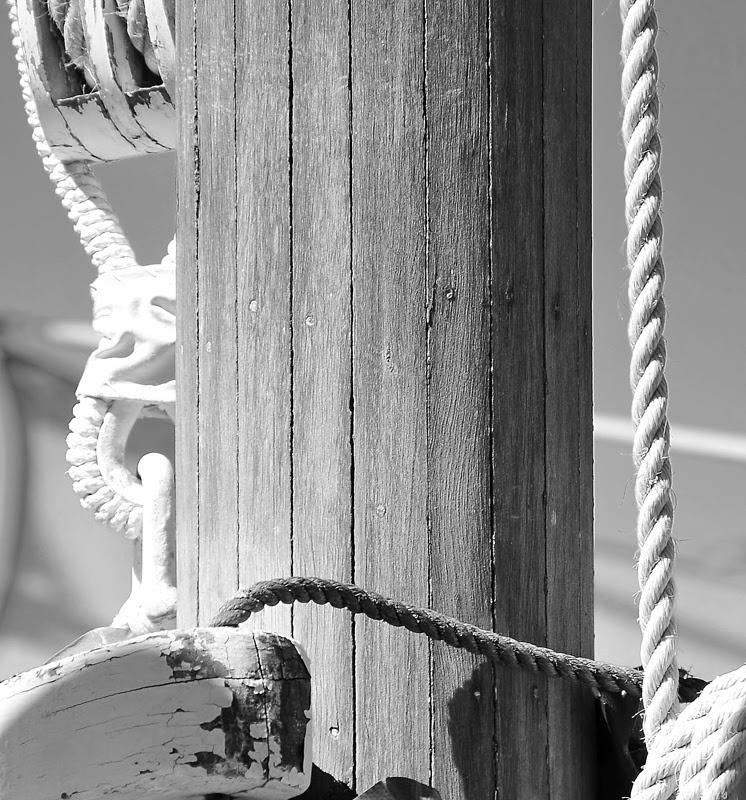 They were principally occupied with the construction, organisation, and management of the lugger fleets and prospected for new pearling grounds. The pearling masters also associated themselves within the pearl and shell market and were responsible for winning overseas markets. 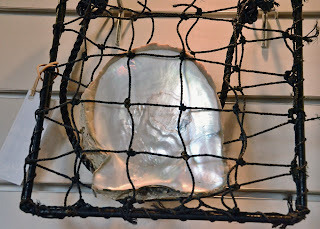 The pearling masters employed various races for work within their home: Each pearling master had a Chinese or Japanese cook, an aboriginal for garden work, Koepanger boys supervised the children at play, did the housework and polished the silver, an Aboriginal woman did the daily washing, a Chinese person did the ironing and the waiter was either a Japanese or Koepanger. 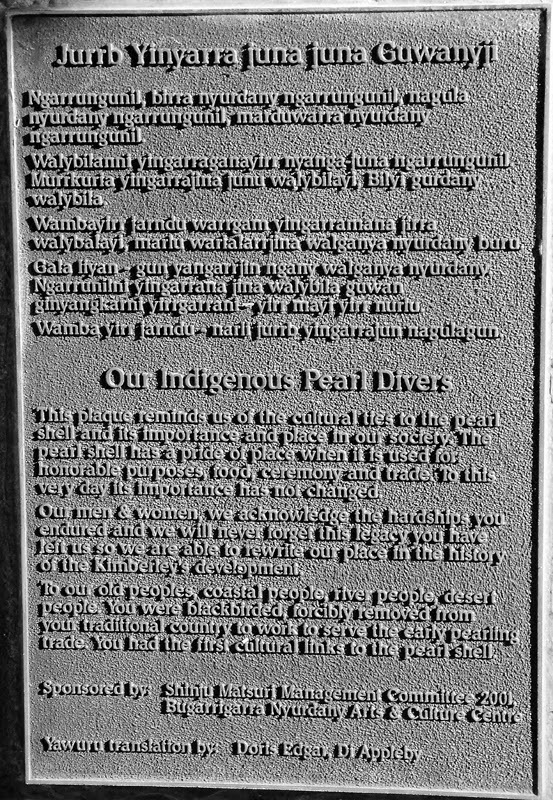 The Malays and Manilamen were usually employed as pearl shell divers, however the Japanese, whom seemed naturally immune against ill-fortunes associated with high pressure such as otitis (inflammation of the ears), otorrhagia (bleeding of the ears), and epistaxis (bleeding of the nose), were recruited and indeed overtook them because they were more ambitious, quicker to learn, and ready to take risks. 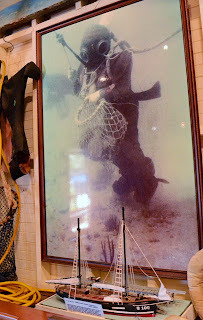 Many of the Japanese divers were used as indentured labour. This means that they were working for no money in order to repay a debt, usually their transportation to Australia. Divers were paid by the amount of shell they collected and because of the dangers involved, very few of these divers ever managed to work off their debt. 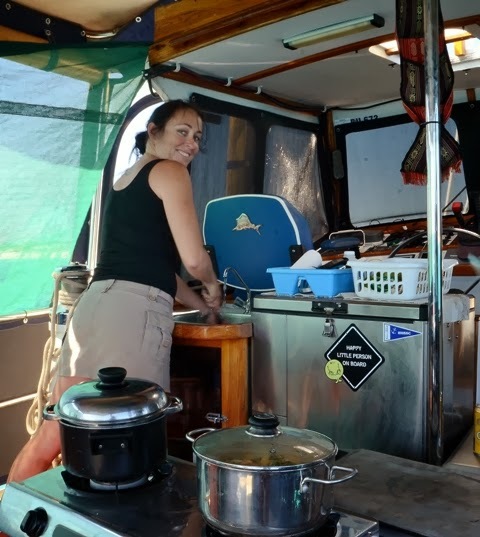 Most of the other races were involved on the deck either as being deck hands, pump crews or cooks. 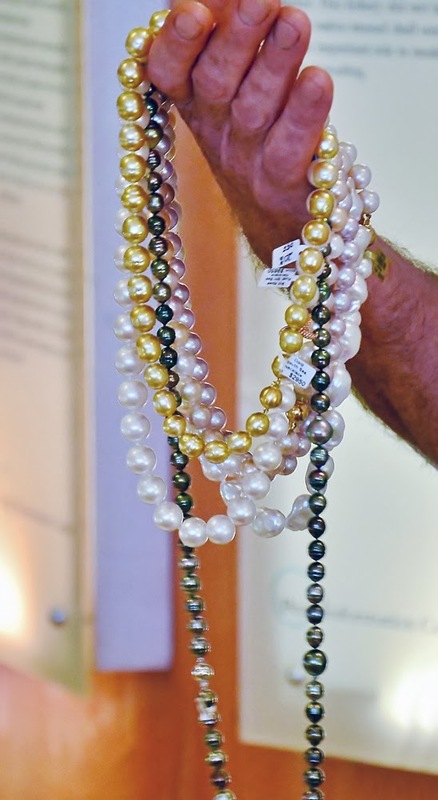 In the Torres Strait, pearlers not only sought pearls11 but also other island resources to maintain the industry and this extended to the ransacking of the islands for food, timber, women and water. Along with the onslaught of diseases, this contributed to significant population decline amongst the Torres Strait Islanders within 30 years to as low as 50% of pre-pearling populations by 1900. Pearl divers regularly faced the threat of shark attack as well as the dreaded crippling effects of the bends17 with every dive. 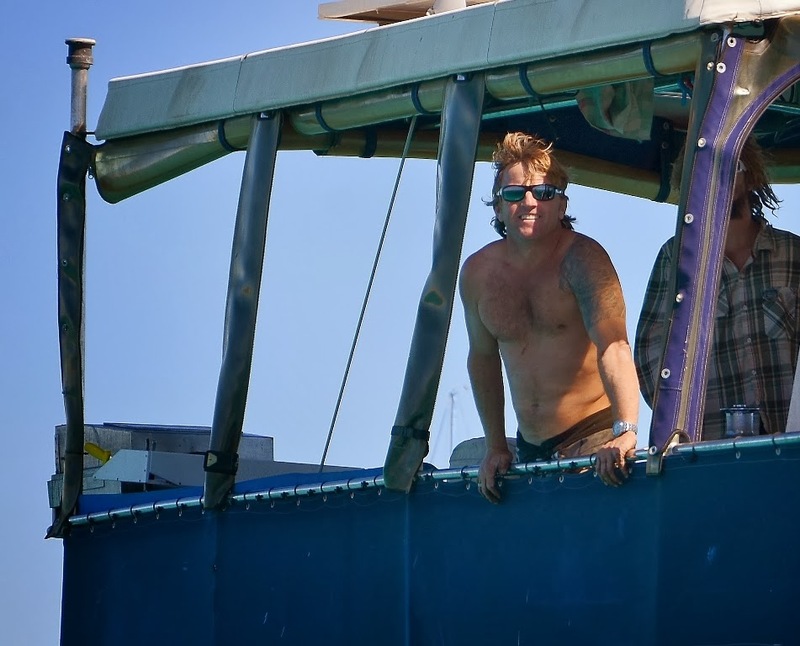 Some sources say that the mortality (death) rate for divers was 50%. In addition, whole fleets were shipwrecked18 in single cyclones. Between 1908 and 1935, four cyclones hit the pearling fleet19 at sea. Around 100 boats were destroyed and 300 men were killed. In the early 20th century, Australia's White Australia Policy20 restricted immigration to mostly white Europeans. This was a problem for Broome and the pearling industry that relied on cheap, expendable labour from Asia. As a solution to this, the government recruited 12 divers from the British Navy as pearl divers. Unfortunately, nearly all of these divers died, so Broome was made an exception to the White Australia Policy. During World War I and World War II, the industry virtually ceased as most of the workers enlisted. The industry relied heavily on its Japanese pearl divers and as a result of Japan entering WWII; these divers were imprisoned in prisoner of war camps. The recovery after World War II was slow as harvesting methods used in the previous decades meant that the supply of shell had almost run out. The development of plastic buttons and buckles in the 1950s devastated the pearling industry by the 1960s. However, new cultivation methods allowed the artificial creation of a pearl. This was usually done by inserting a small plastic ball into the oyster. The beginning of the cultured pearl in Australia! The town was booming. Before World War I, Broome supplied over 80% of the world's mother of pearl. While the pearling masters and their industry prospered the occupation proved fatal for many of the pearl divers. The "bends", drowning, sharks and cyclones ended many dreams of a comfortable life. The Japanese divers had the reputation to be the best, and the hundreds of headstones in Broome's Japanese cemetery speak clear evidence of the risks that came with their work. 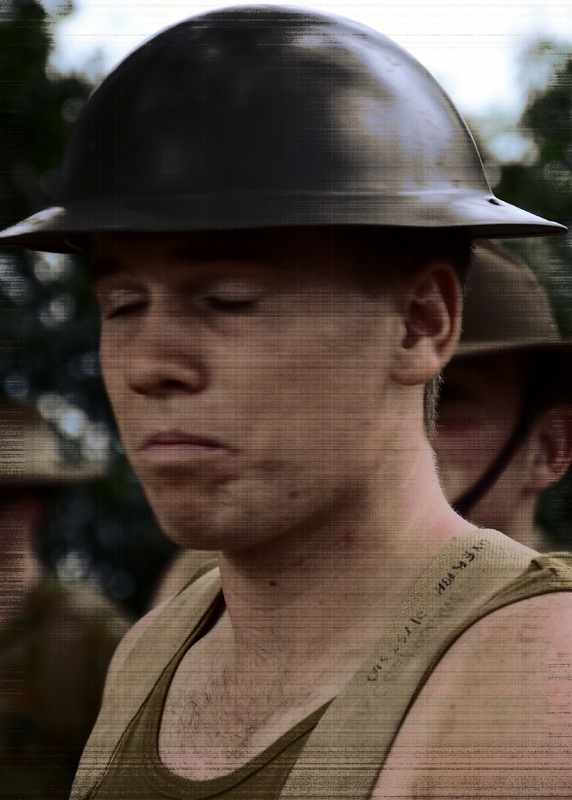 Enter WWI. 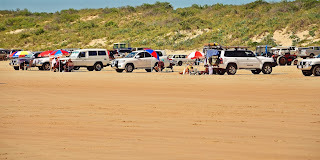 The upheaval and the following depression devastated Broome's economy. There was now also strong competition from the Japanese. By 1939 the pearling industry survived on government subsidies. Next came WWII during which the Japanese divers and crew were interned. 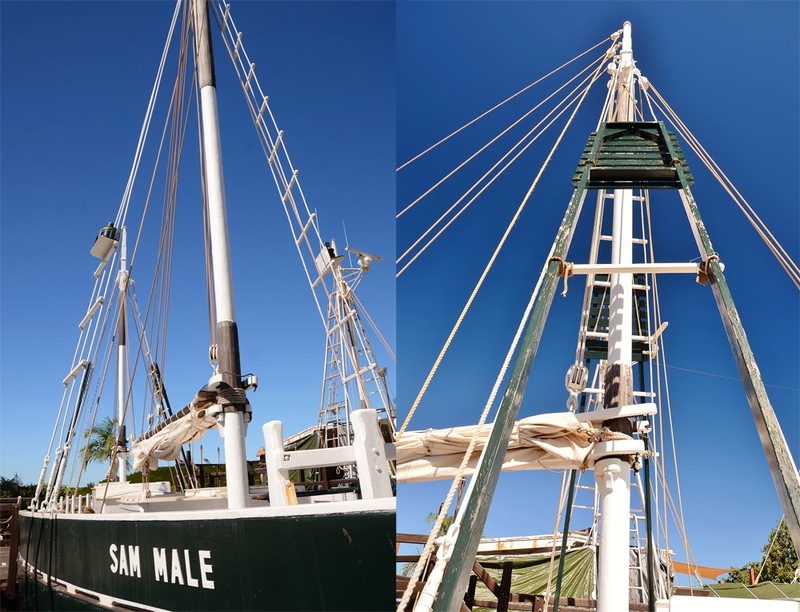 Most of Broome's pearl luggers were sent south, loaded with women and children. The remaining boats were burnt on the beaches to prevent them from falling in enemy hands. Broome and its port were undefended when they suffered the second worst air raid in Australia's history (Darwin of course suffered the worst) on the 3rd of March 1942. The Japanese shot down a plane carrying wounded which had just taken off heading for Perth. They went on to destroy 15 of the Dornier flying boats anchored in the shallow bay. Most of the flying boats were filled with refugees, mostly women and children, many of whom died either immediately or swimming through the burning oil... And finally the Japanese bombers turned to the airfield, where most of the planes were destroyed. When they finally left Broome its buildings, vehicles, and even the ocean around the bombed boats were burning. 24 aircraft had been destroyed and 70 people killed. Three of the flying boats that were destroyed by the Japanese bombings can still be seen in the bay at very low tide today. The only good for Broome that came from the war was the fact that the Japanese competition wasn't operating either. After the war the pearling industry recovered to some degree, but the heydays were definitely over. The plastic button sealed the fate of the Mother of Pearl industry, but not the fate of Broome. Experiments with cultured pearls had been under way for many years, and again it was the Japanese who perfected the process. The results were phenomenal. Broome pearls mature in 2 rather than 4 years like Japanese pearls, and they are also twice as big. 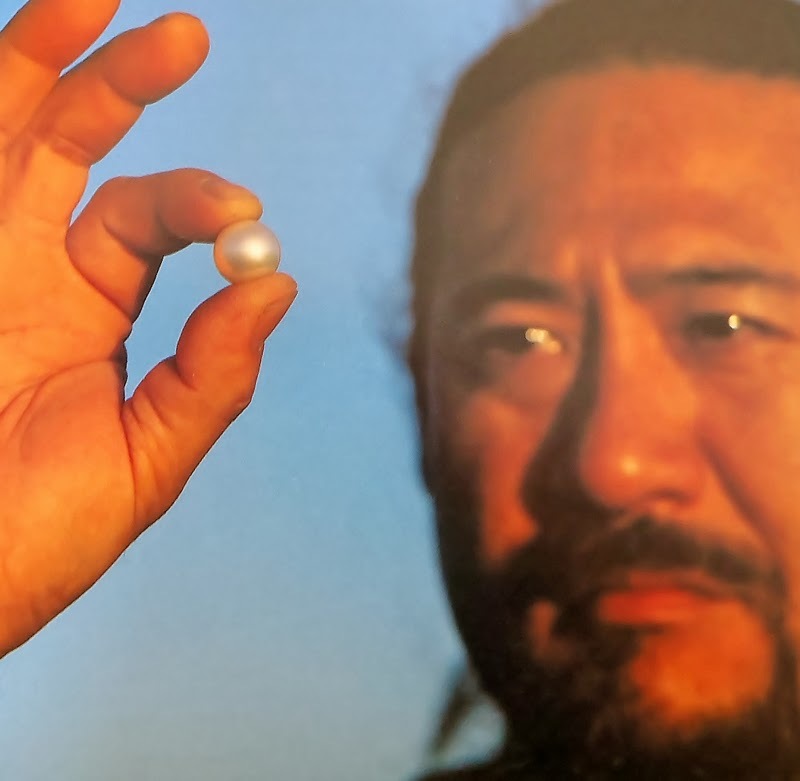 20 years later the town produced up to 70% of the world's large cultured pearls. 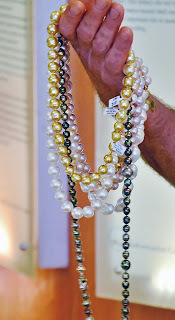 It continues to be one of the world's major suppliers for quality pearls today. Today pearls are no longer the only pillar of Broome's economy. The 1980s saw a new industry emerge: tourism discovered Broome and is growing fast. Some say too fast. 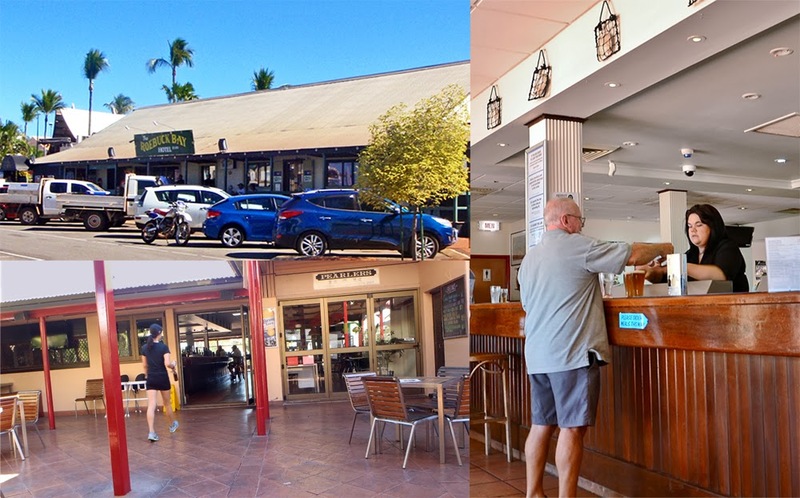 From 2,000 residents in 1980 Broome grew to 11,000 in 1999, by the far the fastest population increase in the history of Broome. Today the town has a population of nearly 14,000. 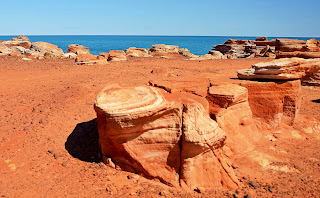 The history of Broome is visible everywhere. And I don't mean the statues and monuments sprinkled across the town. I mean the Broome people. The faces you see in the streets are still a vivid reminder of the wild pearling days of Broome's history. 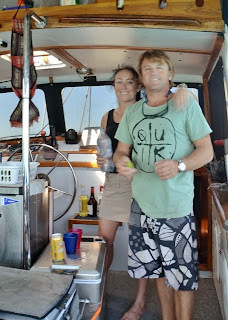 Sam the mechanic – a man of great mechanical knowledge and skill as well as size, the man who helped fix our anchor winch motor with the help of Brendan – they got it fixed in lightning fast time, one day. There are two organizations/clubs that I belong to (Flickr and SICYC) that I like to catch up with other members along the way where possible. In Broome we were able to have a Flickr meet up with Sharon, a lovely lady with an adventurous spirit and a fellow camera snapper.